Walter Adams (1906 -1975) was born in Brighton. He attended Brighton, Hove and Sussex Grammar School, before obtaining a first class honours degree from University College London. After graduating, Adams became a lecturer in history but his career changed direction in 1933 when he became general secretary of the Academic Assistance Council. The Council was founded by William Beveridge following a visit to Vienna where he had learnt of the dismissal of university academics on racial and political grounds. It established a “rescue operation” for displaced academics. Adams’ work for the Council (from 1936 the Society for the Protection of Science and Learning) included running a fund of £70,000 and establishing and liaising with committees in universities across Great Britain. However his time as Secretary was short lived. In 1939 after the School’s evacuation to Cambridge Adams was drafted into the Political Intelligence Department of the Foreign Office. In March 1941 he was granted leave of absence from the School and took up the post of Deputy Head of the British Political Warfare Mission to the United States based in Washington. In 1945 he returned to Britain as assistant deputy Director General of the Political Intelligence Department – then based at Bush House on the Aldwych. At the end of the war the School was keen to regain its Secretary but difficulties over his release from war service led to Adams’ resignation from the School. Adams applied unsuccessfully for the post of Academic Registrar of the University of London in 1945 and in his reference LSE Director, Sir Alexander Carr-Saunders described him as “civil servant rather as statesman”. In 1946 Adams joined the new Inter-University Council for Higher Education Overseas as Secretary and was closely involved with the establishment of universities across the Commonwealth. In 1952-1953 LSE Director Sir Alexander Carr-Saunders served on the commission to found University College of Rhodesia, where Adams became Principal in 1955. The role was complicated in 1965 by the Rhodesian government’s Unilateral Declaration of Independence. In 1965 the School started its search for the successor to Sir Sydney Caine as Director. Initially the selection committee was focused on four external candidates – but when none of them proved suitable or available Adams’ name entered the frame. On 16 June 1966 the Court of Governors approved his appointment. Adams’ arrival and connection with Rhodesia was the catalyst for a long period of turbulence at LSE. 1967 saw a concerted student campaign against the Director-designate culminating in an occupation of the Old Theatre. Unrest recurred in 1969 with the installation of gates designed to prevent students from occupying the campus. The riots led to the School’s closure for 25 days and the arrest of students. The unrest caused huge disruption but one of its legacies was greater student involvement in School developments. 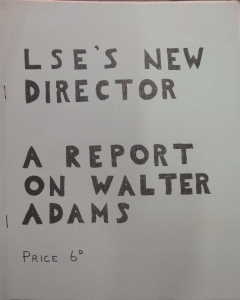 Another legacy from Adams’ directorship was the development of LSE’s campus. The Clare Market building and St Clement’s building extension were both opened during this time and the University of London provided funding for the opening of Rosebery Hall. 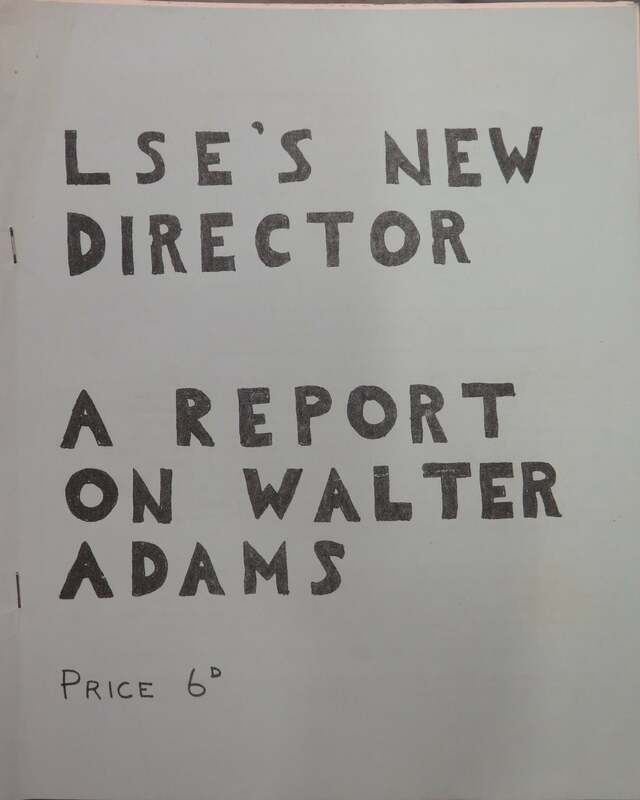 Perhaps the most significant development came in 1974 when the Director’s Report began with the statement: “The School has purchased the freehold site and building, Strand House, in Portugal Street.” This was to become the new home for LSE’s Library. Negotiations for the purchase had begun under Sydney Caine in the mid-1960s and the Library Appeal was chaired by Lionel Robbins, who was Chairman of the Court of Governors until 1973. The Library eventually moved from its cramped accommodation in the Old Building in 1978. Adams suffered a heart attack in 1973 and retired from LSE in 1974. He died the following year during a visit to Salisbury (later Harare) where he had received an honorary degree from the University of Rhodesia.